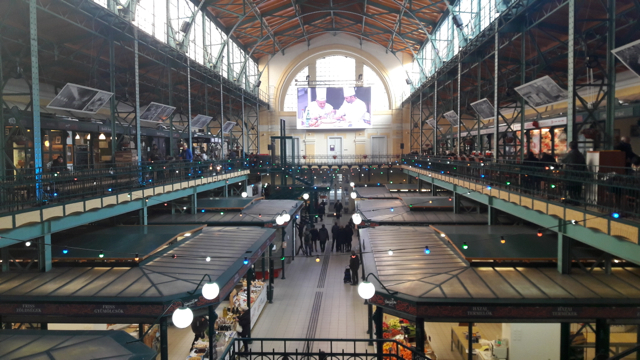 Home / Budapest Market Halls / Which Is The Best Hungarian Paprika And Why? Which Is The Best Hungarian Paprika And Why? The rose paprika of Hungary is generally considered the finest variety. It is made from choice dark red pods that have a sweet flavour and aroma. 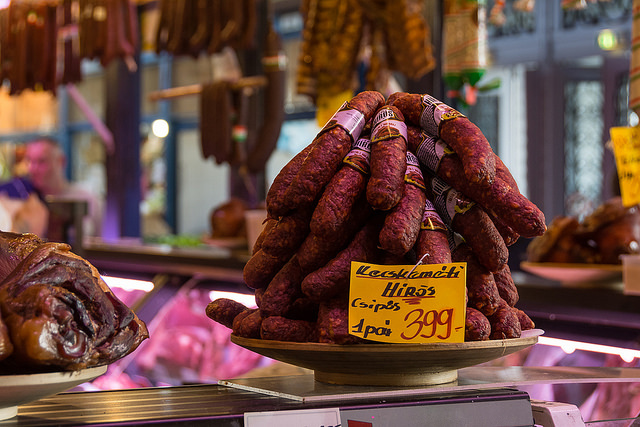 A sharper Hungarian variety, Koenigspaprika, or king’s paprika, is made from the whole pepper. Paprika is not simply a popular seasoning in Hungary, but its at the very core of Hungarian cuisine (I have also personally realized it while living in New Orleans). It is used for its flavor and for its bright color in two varieties: édes or sweet and erős or hot/ spicy. Most households will have both for Hungarian dishes like goulash (gulyás, or gulyásleves: say goo-yaash), which is the flagship Hungarian dish (alas, slightly threatened by more modern and healthy cuisine trends). If you think you have eaten goulash, think twice: most of the goulash or canned goulash sold in western countries is not resembling the real goulash (it’s like having a real New Orleanian gumbo soup or getting a canned gumbo in Sweden). Another version of goulash is made with beans (babgulyás): it is wonderful, very filling though, so better eaten for lunch to give your stomach some time to digest it. Further typical Hungarian dishes made with ground paprika are different stews (beef, pork, chicken, mutton, most typically), which we call pörkölt (perr-curlt) in Hungarian, fish soup, lecsó, ‘paprikás’ anything as ‘paprikás’ means ‘with paprika’ so you can have paprikás krumpli (potato stew with sausages) or paprikás csirke ( a type of chicken stew), paprikás gomba (mushroom stew), etc. As you can see, Hungarian like stewing all kinds of things. I remember eating ‘fake paprika‘ dishes, which doesn’t mean that the paprika is fake: ‘fake’ refers to the fact that there is no meat in the stew (e.g. green pea stew with noodles), so it’s only imitation of the real stew – by default made with meat. Of course, an economical solution for more vegetarian days. :) What else? Other Hungarian dishes with paprika include – well, almost every spicy, salty dish will get a little color with paprika – depending on the cooking style of the kitchen queen or king (green bean soup, stuffed cabbage, different vegetable dishes thickened with roux – főzelék in Hungarian). Best Paprika Brands in Hungary: where to buy and what to buy? Walt­ner treated the ef­fect­s of vit­am­in A found in the Hun­gari­an cap­sic­um, while Al­ber­t Szent-György­i ex­amined vit­am­in C. He dis­covered that cap­sic­um [i.e. paprika] is the main source of vit­am­in C. He pro­duced it in a large amoun­t thus cre­at­ing the pos­sib­il­ity to state the ex­act chem­ic­al struc­ture of this vit­am­in, also c­alled ascor­bic a­cid. He also elab­or­ated a tech­no­logy for the pro­duc­tion of a paprika sort with con­densed vit­am­in C, a most healthy spice. … He dis­covered the cata­lys­is of di­car­bon a­cid C4, a basis for the Kreb­s cir­cu­la­tion pro­cess. His re­searches con­cern­ing the per­ox­ide-sys­tem led to the dis­cov­ery of the re­du­cing a­gent ne­ces­sar­y for ox­id­a­tion – the ascor­bic a­cid. He es­tab­lished the com­pound­s of hex­ur­on a­cid, iden­ti­fied it with the ascor­bic a­cid – an­d this is vit­am­in C.
Growing paprika in the Kalocsa region (mid-southern part of Hungary) goes back to the 18th century, but industrial production only started in the 1920’s. Kalocsa was in strong competition with Szeged, especially in the sweet paprika (édes paprika) market. Their extra strength is that Kalocsa folk dresses are beautiful and girls look pretty with the paprika. I think I am lucky enough to say that I was making paprika garlands with my grandfather. It is an old tradition in Hungary and a practical way of letting the paprikas dry on long strings hung out in front of the house. Although a paprika garland is also very decorative, you won’t see many these days: it is more simple to buy the ground version (as dry paprika powder or as wet paprika cream, like Erős Pista). 0, Paprika contains Vitamin C, anitoxidants and capsaicin. Hungarians use paprika in dishes that you could describe as ‘tons of paprika,’ which turns out to be a healthy thing! 1, Paprika is a Hungaricum, despite the fact that paprika as such only came to Europe in the 16th century thanks to the doctor of Columbus, Diego Chanca. Paprika (or capsicum in Latin) comes from Central America. Europeans were quite suspicious about the new plant: for two centuries it was only used as a decoration. 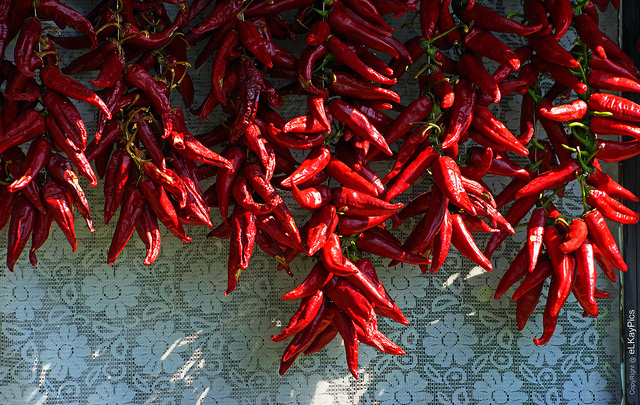 Paprika came to Hungary in the 16th century: there are documents from 1570 about the ‘red Turkish pepper‘ as it was called at that time. In the 17th century there are already family names with Paprika. 2, Paprika became a popular part of cuisine in the 1780’s in Hungary. The technique of making sweet paprika was gradually developed in Hungary from the 1850’s by getting rid of the seeds and stems, only keeping the pods. 4, To make dishes hot, besides spicy ground paprika, several Hungarians also like wet paprika cream (especially in meat soups, goulash and stews) and the small hot green pepper originally imported from the excellent Bulgarian gardens in the 1870’s. 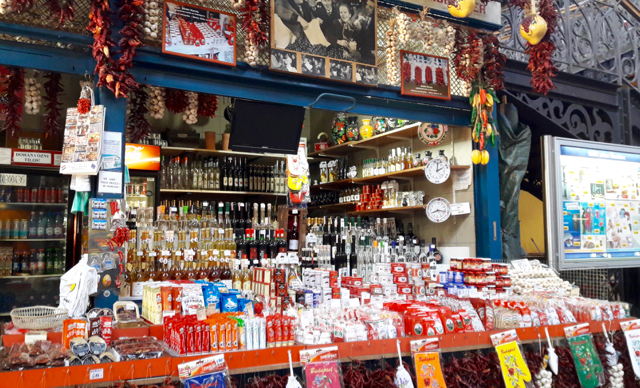 5, There is a Paprika Museum in Szeged with standard exhibitions of the His­tory of Szeged Paprika as well as the Pick Salam­i. En­trance fees are dirt cheap (at the time of writing in 2008: 480 HUF/adult, 360 HUF/chil­dren, stu­dent­s an­d pen­sion­er­s). Szeged is about 170 km/ 106 miles from Budapest. There is also a Paprika Museum in Kalocsa (see the map above). 6, paprika is NOT red pepper. It is totally different. This was very informative. Judging by the picture the market with the peppers, there must be many types of each pepper with their own name. Is there a web site where I can reference the names of the peppers used for each category of paprika peppers? 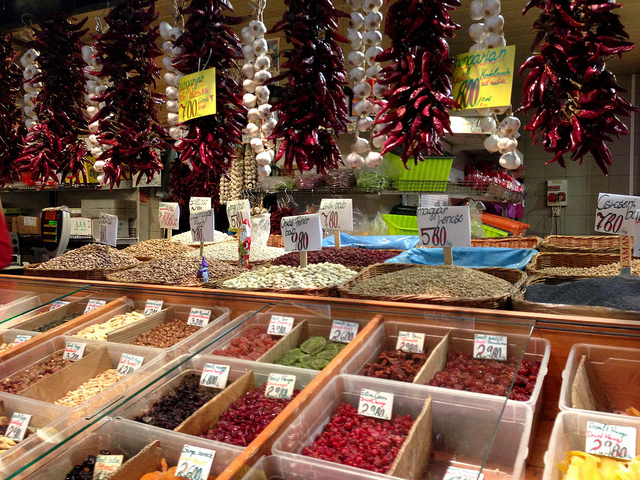 Indeed, there are a lot of types of paprika, which are used to make the red powder for spicing in Hungary. The types are differentiated by their hotness and named after their origin (kalocsai, szegedi, szentesi, etc. ).